Mayonnaises and dressings are traditionally made with egg as emulsifier. The challenge in this area is to find the right replacement for the egg emulsifier while achieving the same creaminess as in the original mayonnaise or dressing. KaTech has experiences with many different plant based emulsifiers and knows about the advantages and disadvantages of each one of them. Whether for different fat levels or cleaning up labels, KaTech has a lot of solutions to offer. At KaTech we like to experiment on different flavours. Our favourite vegan dressing recipes are a fruity mango dressing or hoummous dressing which is especially nice on green salad. 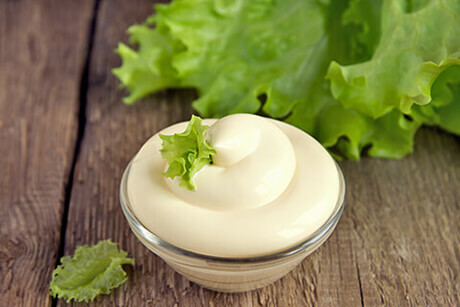 Mayonnaise can be found having different properties used either as a traditional sauce to dip, as base for salads or as sandwich cream. Different properties needs different textures such as gelled texture or be able to cling to salad and absorb excess water, the right spreadability as well as the right mouthfeel in the final product. As clean label is still a big trend in Europe, KaTech has been working hard to find clean stabiliser systems for all sorts of textures and properties at different fat levels. Please get in contact with us and use our expertise in mayonnaises. Emulsified dressings are the challenge of the vegan dressing market, as traditionally egg or milk protein are being used as emulsifiers. Plant based emulsifiers do not have the same properties and need to be combined with the right functional ingredients to develop the product match the customer is looking for. Our recent development is a houmous dressing as an alternative to the current taste variations available. As houmous is a popular product, the consumer already knows what to expect of a houmous dressing. It tastes delicious with either mixed vegetables or green salad. There are more ideas in our drawers. If you are looking for ideas for vegan dressings, just get in touch with us. Difficulties to scale up kitchen trials to factory equipment. If those issues sound familiar to you, please get in contact with us. By looking at the recipe we can give ideas on how to optimise the cost of the product. Sometimes ingredients can be exchanged with cheaper equivalents or production processes can be optimised to reduce waste.